If you surf the net on any given day, you're always going to find articles about goal setting. Because it's important. Goal setting helps you set the stage for what needs to get done regarding your life, career or business goals. However, so many times, mainly when the goal setting is focused on our personal life goals, we fall short. Not too long ago I read that fewer than 10 percent of the people who begin with a goal for their personal lives at any given point will be still working on it a year later. Look at your own life. Have you told yourself that you were going to do something big, then get moving, only to watch the dream and goal fade after a couple of weeks or months? Why does that happen so often? Most people in their lives make it a point to decide to do something and set out goals only to not follow through. Many times, countless people say they want to achieve something and then not too soon after, the intentions fade and the frustration sets into their reality. The reason this happens so frequently is that when people are making decisions, the fact is they have not truly decided. A decision is not made when you first say you want to do something. A decision is made only when you consistently follow-through to make the dream a reality. You see, a decision is something that only becomes a reality when you have taken the little steps each day to support the dream. Let's say you have "decided" that you want to go back to school and retrain so that you can move more onto another career. You're tired of your current job prospects, don't see any more room for advancement, or just need something different. One day, you decide that you want to go back to school. So, in your mind, you made a decision. You may even tell those around you that you've decided to go back to school and retrain. The reality is that you have not really "decided" anything until you've registered, attended classes, and gotten your certificate of completion. Up until you have the retraining completed, on any given day, you can drop out. Therefore, a decision is not concrete until you have fully committed to it. The most successful people who achieve their goals have several things in common. These are the factors you have to keep in mind to ensure your goal setting is also successful. Clarity: Successful goal-setters are clear about their goal. In other words, they have every element of the objective apparent as if it were already a reality. The more detail, the better. Consistent Habits: Those who succeed in their goals understand that it's the daily habits that will get them to the finish line. In our example, it's the going to school each week and not finding excuses when the going gets tough and the temptation is there to quit. Plan: Some people are planners and others prefer to go with the flow. The reality is that with goal-setting, studies have shown that the planners win. Develop a plan for your goal and stick with it. No Out: Many times people talk about Option B, but lots of times that's just an excuse to deviate from the goal. Forget Option B. When a challenge arises (and it will) in your work toward the goal, adjust, but do not stray. Don't create an Option B and as they say, "burn the boats." 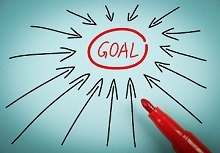 Goal setting is essential to get ahead in life or business, but wanting it is not enough. Equally, merely saying you're going to do something is not enough. Goal setting encompasses several factors that will ensure you're not one of the majorities of people who set out on a goal only to have deviated from it or let it fall by the wayside in less than a year's time. © 2018 Wayne Elsey and Not Your Father's Charity. All Rights Reserved.